Our recipe for Mini Beef Wellingtons with Cabernet Sauce is perfect for a romantic dinner for two on Valentine’s Day. Thick slices of beef tenderloin, mushrooms, fresh herbs and blue cheese are enclosed with puff pastry into individual packages. They are baked to perfection in a hot oven and served with a savory Cabernet sauce. We love going to dinner at a fancy, upscale restaurant to celebrate a special event with all the ambiance of white tablecloths, candles, wine, and soft music. It is nice to just take our time over dinner, lingering with that last glass of wine, coffee and a fancy dessert. But over the years there have been disappointments on Valentine’s Day. Mainly due to the restaurant’s heavy reservation list and the need get the table ready for the next guest. 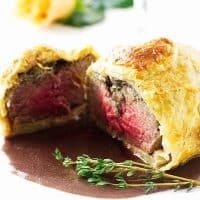 his recipe for Mini Beef Wellingtons with Cabernet Sauce is an easy version of the old classic and a lot less expensive than going out to that high-end fancy restaurant. And, I guarantee it will Wow any beef lover. For many years now, we do a classy Valentine’s Day dinner right at home with a special entree, our own white tablecloth, a good bottle of wine, candles and soft background music. Fresh roses are always the Valentine’s Day gift for the centerpiece. What would life be without fresh roses! So….Mini Beef Wellingtons with Cabernet Sauce! It’s what’s for dinner this Valentine’s Day! The original Beef Wellington was created in honor of the Duke of Wellington who won the Battle of Waterloo way back in 1815. He was a beef-lover and served this entrée to his guests frequently and it has become a classic in Britain. There are many ways to prepare Beef Wellington. 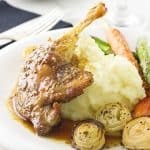 The original version was prepared using a large beef tenderloin topped with slices of pâté de foie gras, which is a preparation using fatty goose liver, then a mixture of chopped mushrooms and herbs known as Duxelles was added over the pâté de foie gras. 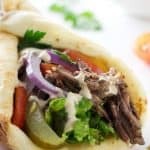 The beef was then wrapped with a tender, homemade, buttery pastry and baked to perfection and sliced into portions at serving time. 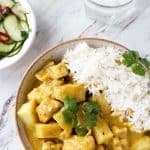 This recipe is a scaled-down version of the original and with our own changes. Beef tenderloin is one of the most tender cuts of the beef with very little marbling fat. And we all know fat equals flavor. 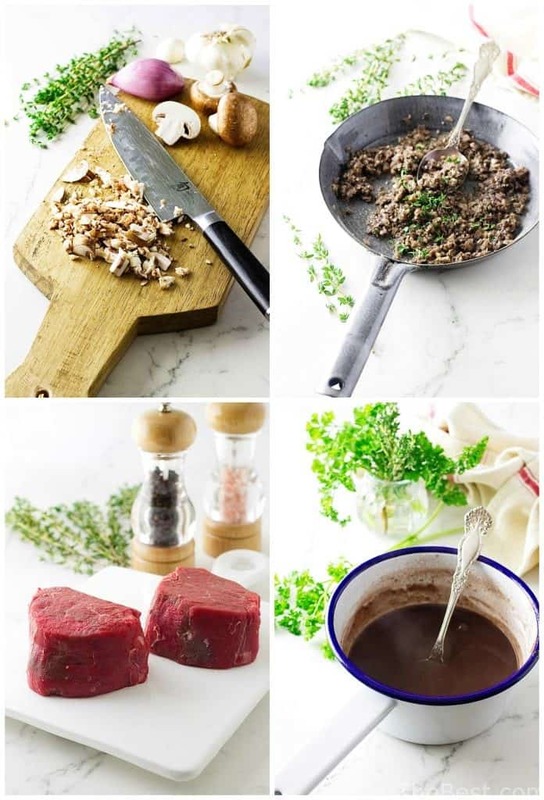 Because of the lack of fat beef tenderloin can benefit from additional flavor which is the reason for the fatty pâté and mushrooms in the original recipe. We are skipping the pâté de foie gras and substituting a rich, flavorful Maytag blue cheese instead. Some recipes make the pastry from scratch as I am sure the British did in 1815. But puff pastry is a wonderful invention which also makes this recipe less complicated. Thick slices of beef tenderloin, also known as filet mignon, are brushed with oil and seasoned, then seared quickly until a rich brown crust is achieved. These are set aside to cool while making the mushroom mixture. The chopped mushrooms, shallots, garlic, wine, and herbs are cooked until the moisture has evaporated then they are set aside to cool. In the meantime, we prepared the Cabernet wine sauce. This rich sauce is a reduction of chopped onions, Cabernet wine and beef broth. After it reduced it was strained through a fine-mesh sieve, then slightly thickened to a velvety smooth sauce. To prepare the packages of beef for the bake-off we rolled one sheet of puff pastry and cut it in half with a slice of prosciutto added to each section. The idea of the prosciutto is to eliminate a soggy crust on the bottom. Each cooled tenderloin was placed on the prosciutto, the top was spread with blue cheese then with the mushroom mixture. The puff pastry is pulled up, over and around the beef, enclosing and sealing it into a neat package. Then back to the refrigerator to re-cool. When ready to bake, the packages are brushed with an egg wash to give a nice glaze, then baked in a hot oven until golden brown. We served these Wellingtons with a simple salad, creamy mashed potatoes and roasted asparagus which, by the way, roasted on the same baking sheet with the Wellingtons. 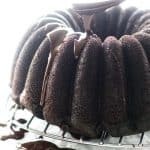 Part or all of the recipe can be made in advance and baked off just before dinner. We actually made the mushroom mixture the day before and refrigerated it until time to assemble the Wellingtons. 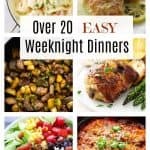 This is an easy version of the old classic and a lot less expensive than going out to that high-end fancy restaurant. Get out the white tablecloth, candles, a good bottle of wine and enjoy an evening of fine dining and romance! These Mini Beef Wellingtons with Cabernet Sauce are the ultimate beef lover's treat! 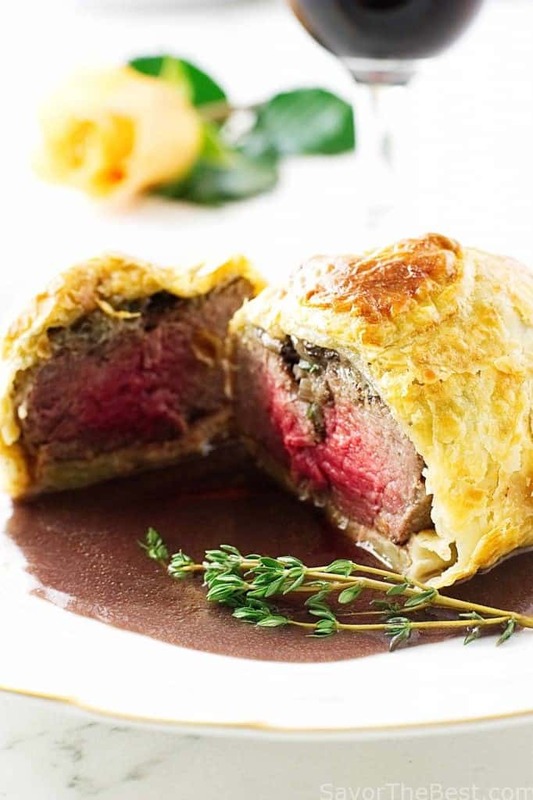 Tender beef tenderloins, mushrooms, herbs and blue cheese are enclosed in puff pastry into individual packages. They are baked in a hot oven until golden-brown outside and a medium-rare inside. Brush oil on all sides of each tenderloin and season with salt and pepper. Heat a cast iron griddle or heavy bottomed skillet to smoking hot and sear the beef on both sides as well as the edges, about 3-4 minutes. Transfer the beef to a plate and place in the refrigerator to cool completely. Melt the butter in a small skillet set over medium heat and add the mushrooms and shallots. Cook stirring often until tender, about 5 minutes. Add the wine and simmer until all liquid has evaporated, about 4-5 minutes, stirring occasionally. Remove from the heat and stir in the parsley and thyme. Add salt and pepper to taste. Transfer the mixture to a small dish and refrigerate to cool. In a medium saucepan set over medium heat, melt 2 tablespoons butter. Add the onions and thyme, cook stirring until the onions are soft, 2-3 minutes. Add the wine and bring to a boil and reduce by two-thirds, then add the beef stock. Continue to boil to reduce to half. Strain the sauce through a fine-mesh sieve into a small saucepan and set over medium-low heat. Add the Worcestershire sauce and whisk in the mustard. Add salt and pepper to taste and bring back to a boil. In a small dish add the remaining 2 tablespoons of soft butter and the flour, mash to a paste. Remove the sauce from the heat and whisk the butter/flour paste into the sauce. Return to a low heat and cook about 2 minutes longer, until the sauce is slightly thickened. Remove the sauce from the heat, cover and set aside. Unfold one sheet of puff pastry onto a lightly flour-dusted work surface and roll to a size of 11 x 11 inches square. With a sharp knife cut the pastry in half, place one half on a parchment lined plate and reserve in the refrigerator. Working with the one pastry, lay a slice of the prosciutto on the pastry then place one of the steaks on top. Spread half of the softened blue cheese on top of the steak and then add half of the mushrooms mix over the top. Fold the pastry dough over the prepared tenderloin, enclosing it into a neat package. Pinch the edges to seal well and trim away any excess pastry. Transfer the wrapped tenderloin to the refrigerator and proceed with the remaining tenderloin. Chill both tenderloins in the refrigerator for a few minutes while the oven is heating. Transfer the Wellingtons to a parchment lined baking sheet. When ready to bake brush each tenderloin with the egg wash. Bake until the pastry is golden brown, about 15 minutes rotating the pan about half way through the cooking time. Transfer the tenderloins to a plate and allow to rest for 3-5 minutes before serving. While the Wellingtons are resting reheat the Cabernet sauce and transfer to a serving pitcher. 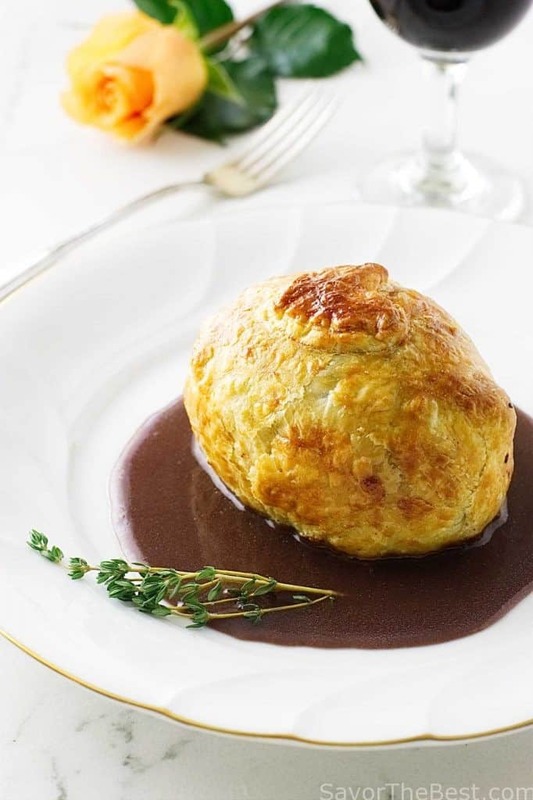 To Serve, spoon 1/4 cup of the hot Cabernet sauce in the center of each serving plate, add a Wellington to the sauce, garnish with fresh herbs. Serve the remaining sauce on the side for mashed potatoes. 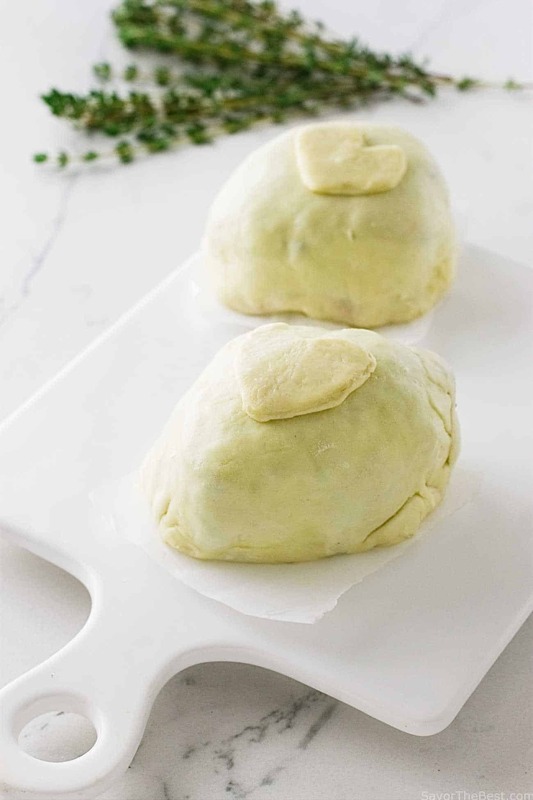 These individual beef Wellingtons can be prepared in advance and frozen. They should be defrosted overnight in the refrigerator before baking. It is important to have the tenderloins and the mushroom mixture cool before adding to the rich, buttery pastry dough. Searing the beef will increase the flavor and will retain the juices, preventing the pastry to become soggy. The mushrooms can be chopped in the food processor. The beurre manié mixture of 1:1 for 1 cup of liquid will make a thin sauce...increase the butter/flour proportions for a thicker sauce. 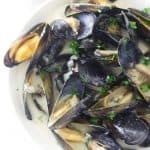 Beurre manié is intended as a last-minute sauce and should be simmered for only a few minutes. After wrapping each beef Wellington, use the pastry scraps to cut designs to add to the top of each package and brush with the egg wash. This looks really, really good. And I love the idea of the blue cheese in place of the pate. You call it scaled down. I call it inspired. And the strained sauce is a nice professional touch. Very nice! Wow, mini wellingtons is such a brilliant idea! They look super impressive and delicious! We never go out for dinner on Valentine’s Day these days — restaurants are crazy busy, and they often raise their prices. Besides, we’re good cooks! So we make ourselves a feast. 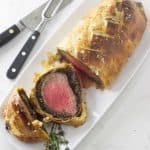 I really like the idea of mini Beef Wellington. I made the traditional kind once, decades ago, but it was just too much food (although the leftovers were good!). This is a much more sensible idea. Thanks! Tender, earthy and buttery…that’s a party of flavours and that beef is perfectly done, Pat.